Everyone really brought their A-game with this film. Impeccable performances. Benedict Cumberbatch was just superb, though I’d honestly expect nothing less from him. He’s brilliant, and he really gives a career-defining performance with this film. This is the cinematic debut for screenwriter Graham Moore, but you wouldn’t know it with how masterfully written this work is. I foresee more great works in his future. This seems to be the bane of Hollywood. Or rather, Hollywood is the bane of diversity. Though, I suppose, the film’s not truly at fault with this one. History is. There aren’t any persons of colour in this film. And there’s only one female character, who begins the story as a product of her time and ends as a tenacious woman with a voice. Fortunately, this film did neither of those things. They stated clearly that Turing was gay and that the one great love in his life during his school days at Sherborne School: the only person to ever show him compassion, Christopher Morcom. Though nothing ever comes of this as Christopher dies of bovine tuberculosis before he has the chance to tell him. Moreover the film delves into the criminalisation of homosexuality during that period in the U.K. More on this below. Not much to really expound on here. I simply loved it. Scoring and sound were perfect. To tell the full story of Alan Turing we have to go deeper than his contribution to the Allied victory of WWII, which subsequently laid the foundation to the modern computer. 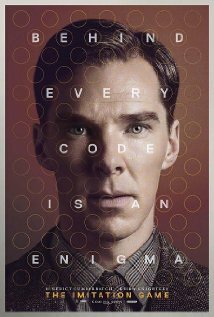 Alan Turing is responsible for creating the machine that decrypted the German’s unbreakable code: Enigma. He was lauded by Winston Churchill as having made the single greatest contribution to Allied victory against Nazi Germany. Despite this, however, Alan Turing was prosecuted for homosexual acts in 1952 and was given the option of chemical castration by regular oestrogen injections (to “cure” him of his homosexuality) over time in prison. Within a year of this injections, Turing committed suicide by cyanide poisoning. This is not simply another WWII story of victory against Nazis. It’s a story of gross intolerance and bigotry. The man did great things for the world, but he was criminalised because of his sexuality, which he tried desperately to keep secret. The film moved along great, but then after Christopher started working, it jumped really quickly to the end of the war. This is how films should be made: with unassuming humility with the sole purpose of telling a story.